drooz doodles: feelin' FALL like I was a 3 year old! feelin' FALL like I was a 3 year old! I feel like a kid again! 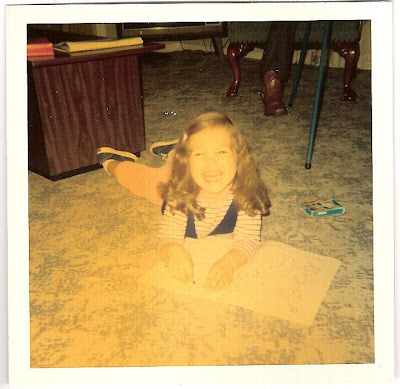 (this is me – Fall of 1972 , at almost 3 years old … doodling then too!) Look how happy I was then…now..skip ahead to Fall 2008 …– that’s how I 'm feeling these days too! With the kids back to school.. and the return of scheduled days, and more work (creative) hours for me… I’m as happy as can be! It almost feels like “the new year” – I’ve been making lists of resolutions, goals, and projects to complete. I’ve been working on wrapping up a new collection for demdaco – debuts July 2009. About 20 pieces for the girls and 20 pieces for the boys – Cute! Cute! Cute! We decided on some new formats and materials… it is so interesting how this whole process works – I have so much more to learn! The newest collection will be out in October- I hope to have pictures to share soon. Till then... here's something new... a few new simple sign designs just for fall..
"CROW"- "SIT A SPELL" - "GOING NUTS"
I’ve been filling orders for simple signs like crazy! – they are selling like hot cakes since the new Fall limited edition styles were just featured in Country Living magazine! (YEAH!) I’m up to my neck in black crows! EEkkk! I'm reading: feelin' FALL like I was a 3 year old!Tweet this! I love the black crow...perfect for my favorite holiday! Congrats - you just keep getting that press, no matter what! I like the new designs - very cute, I am ready for fall it is boiling her in California. I love that picture....I just found my old comic books I used to make when I was like 7 - I was going to post them too....hope you are well! Hmmm - we are almost the same age....I would have ALMOST been 3 right now in 1972! send the crow to dina...haahhaaa, don't ask why, she has a thing for crows! These are so pretty and fun... def going on my wish list! !